Oh my gosh I have so many blogs to catch up on it's insane! I'm trying to comment on a bunch of them too so hopefully nobody feels left out!! So, until I can upload my pictures/videos from the wedding and our vacation...I'm holding off on blogging about them! But I can tell you guys a story. When we were in the subway waiting for the BART to take us back to the San Francisco Airport to take us home, I called my parents house to let them know what time we would be arriving (they were picking us up from the Long Beach airport that day). My dad proceeded to tell me that my sister had been house/dog sitting for our neighbors (which is not unusual) and when she got home late Friday night...she couldn't find Buster. This is not Buster, but the same breed. She called my mom to come help her find him. My mom crawled out of bed, grabbed a flashlight, and went over to help. She walked to the house a couple doors down. Apparently the neighbors don't have a problem leaving their back door open a few inches. Just open enough for him to be able to go outside to go to the bathroom and then come back inside. They had something blocking the door so it wouldn't open further than that. Something attacked and ate Buster. It came IN THE HOUSE and got him. It could have been either a coyote (there are a lot in the area) or more likely (considering the evidence left behind) a small bobcat. The fact the it would come in the house makes that animal VERY dangerous. Poor Buster. Poor neighbors. My poor sister and mom who found it and cleaned it up before the family came home. Apparently our nice neighbor is such an emotional wreck (understandably) that she is now trying to piece the story together. She wants to know why my sister hadn't let him in before it got dark. My sister and mom said they never asked her to. Just whenever she was going to bed. My neighbor wants to have my sister over this week to ask her about it. My sister already feels terrible. Oh, and the same neighbors are still haunted with the fact that their cat (who was so friendly and like our neighborhood cat) was also eaten. By a coyote though. They hadn't been home to let Kirby in before dark either. What do you guys think? My sister obviously should not have been home so late when she had that responsibility but I don't believe she is to blame. It was a freak accident. It should not have happened. I don't believe it should be put onto my 17 year old sisters shoulders. She is the most mature, responsible young lady I know...normally. It's not my mom's fault either. She was asleep and didn't know my sister wasn't in yet. My neighbor is pointing fingers. It's making me double think getting a small dog. I couldn't handle it if that happened to my dog. I'd go catatonic for sure. Ahh poor little dog! And your poor mom and sister for having to find that terrible scene and clean it up! Your sister definitely shouldn't be blamed for it. I'm sure she already feels bad enough. I feel sorry for your neighbors, but no one is to blame, except for maybe the hungry bobcat! It's just one of those freak accidents, no one is to blame :( Hope your sister is ok.
Aw, that's so sad :( And no, I don't think it's your sisters fault. I feel terrible for her, I don't even know what I would do. My cat isn't allowed outside for that reason. OH MY WORD...This made me want to cry!! My parents have a Boston Terrier and that breaks me heart. Your poor sister, she will probably have to live with this thinking she did something horribly wrong. I hope those people don't try to make her feel more guilty than she probably already is. poor poor buster! definitely not your sister's fault though! I feel bad for Busters owners, but I do not think it was your sisters fault! It an unfortinate incident, and I don't think there is no one to blame! I have to say that I feel bad for all parties involved...but what no one has mentioned yet is actually how LUCKY your sister is! If she HAD been home, she still probably would have left the door open for the dog to go in and out...and what would have happened if she was there and that animal came in the house? It's a tragic story, and in no way is your sister at fault! I have talked about being sick a little on my blog. I was diagnosed with a kind of nervous system cancer around Thanksgiving. The journey should be over soon though!! WOO! Thanks for putting up with your mom's mental state and toning it down. I appreciate it, and everyones comments. We are going over soon to try and do what needs to be done. These really are good people, just devastated. Block your doggie doors people. Even the small ones. 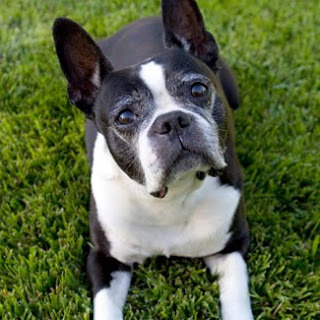 Buster was a tiny Boston Terrier, about the size of a small cat. Sorry Shell, I took some of your space. I feel better.